It’s not too late to plan a romantic Nebraska state park getaway or evening out for Valentine’s Day! At Lewis and Clark State Recreation Area, enjoy lakeside views, discounted lodging and Valentine gift packages with goodies like flowers, chocolates and cheesecake. 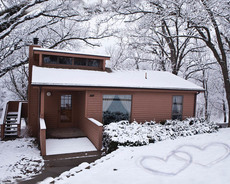 Book a cabin Feb. 9-14 at Eugene T. Mahoney State Park and add a Valentine package to your reservation! Lodging is priced at a 30 percent discount Sunday through Thursday. Both families and couples can enjoy a delicious Valentine’s dinner at Platte River State Park Feb. 14-15. Ponca State Park’s ever-popular Birds and Breakfast event combines scrumptious food with fun outdoor birding activities. Learn more at our website. A park permit is required for each vehicle entering a park.